We spotted Sea-n-Stars sitting off Ida Lewis Yacht Club in Newport Harbor just before the mid September boat show. A sunbleached-blond guy with two barking dogs was just attaching on a for sale sign. 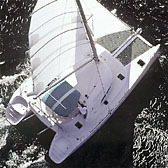 It took about a month for the deal to come together ... the boat was then in Annapolis and I drafted ["for just a thousand miles"] my retired sailing buddy, Captain Vic, to help move the Cat to Cape Canaveral. Shake down cruise started Columbus Day [Oct.14, 2002] right after the Annapolis boat show. What was supposed to be a short couple-of-hours shakedown cruise saw a great beam reach and we elected to overnight down the Chesapeake through Norfolk to pick up the Intercoastal waterway --- 26 freighters but no towed barges passed by. Good thing the radar worked well, and the previous owner left some canned goods and coffee on board. Shakedown cruise segment ended 30 hours later at Coinjock at Mile Marker 50 on the Intercoastal. Had a great list of things we needed and couldn't get. Stocked up on real food though. Oct. 16 continued on the Intercoastal Virginia Cut Route. We decided to stop for fuel and tried to start the port engine ... had been running starboard engine most of the time. Engine ran but stalled when pushed into gear ... classic crab pot syndrome ... and as we came into the dock we also lost the ability to maneuver operating on the starboard engine alone. So now we had one line [the wrong one] on the end of the dock and were right around and up against the trees on the canal edge with a strong current pulling us down stream from the dock. On our shakedown list of things to get was the mask, fins, and sharp diver's knife we needed, but didn't have. So we called for a diver, and next morning [Oct. 17] the diver slips into the water and comes up with two pieces of rope. One was attached to this tiny piece of chopped up float about the size of a quarter ... and the other seemed anchored in the mud. A little huffing and puffing and we had a brand new crab pot with a couple of dozen crabs. That ... cost us $150 [diver and helper]. Off we went to Albemarle Sound and anchored at Manteo for a hefty steamed blue crab dinner [they turn red when ready] and a million mosquitoes. Oct. 18 we motored down Pamlico Sound [inside Hateras] ... flat seas with a light wind right on our nose. We anchored well after sunset, based on GPS coordinates, somewhere in a pitch black cove near Nuese River Junction. Oct. 19 back in the intercoastal to anchor that night in Mile Hammock Bay ... where next morning [Oct. 20] the U.S. Marines [Camp Lejune] were also doing some amphibious drills at 4 a.m. after which we continued to Southport Marina. Oct. 21 the wind went northwest and we bailed out of Southport off-shore, ran the spinnaker about 10 hours till the wind turned south. We shadowed the coast about 15-25 miles out to be in VHF range with an over-night to Hilton Head for dinner with my brother ... and we filled up the nearly empty tanks. Oct. 23 ... Wind dead on the nose, we motored another off-shore over-night pretty much straight line down 81 degrees to Datona where Vic left and my Florida brother Richard joined the boat for the last leg to Cape Canaveral. Good weather, electronics that worked, great trip.